Parrikar’s statement about being ready for bilateral talks with Karnataka to release water came after he met BJP president Amit Shah in Delhi. 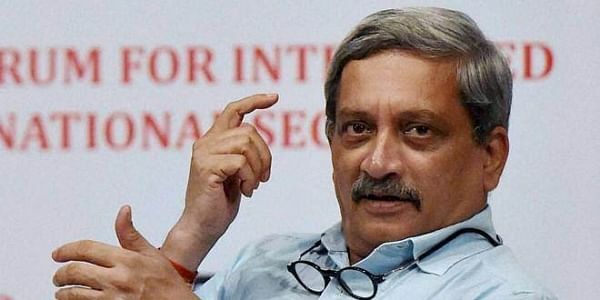 PANAJI: The Goa unit of the Shiv Sena has accused Chief Minister Manohar Parrikar of compromising Goa's interests on the Mahadeyi river. The Sena's accusations come after Parrikar recently wrote to BJP’s Karnataka chief B Yeddyurappa expressing willingness to have bilateral talks to release Mahadeyi river water to Karnataka for drinking purposes. "We condemn Parrikar's move to allow the water from River Mahadeyi to be diverted by Karnataka government. The move is clearly chalked out for the sake of winning upcoming elections (in Karnataka)," Sena’s Goa spokesman Rakhi Prabhudessai Naik said in a statement issued here. "Parrikar should not have agreed to sell the interest of Goa for his party’s victory in Karnataka," she added. "He (Parrikar) has made a mockery of the Goan people who have high respect for his statesmanship. Parrikar should not forget that he is Goan first, and then a BJP leader," she said. The party also expressed surprise over the silence of the Goa Forward Party, the BJP's ally, on the issue. She said that the Sena expected GFP leader Vijai Sardesai to not bend to the greed of power at the cost of Goans. She added that the Sena always kept the interests of a state above party politics and its stand against its own government in Maharashtra was an example.